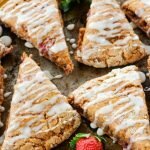 My whole-wheat strawberry ricotta scones are drizzled with a sweet lemon glaze that will have you coming back guilt-free for more. The ingredient of the month for the #Foodiemamas blogger recipe group is strawberries. The possibilities are endless when baking or eating this prized sweet fruit. We eat strawberries year round in my family. They’re great alone or in just about everything. Be sure to check out all the wonderful strawberry recipes from my #Foodiemamas bloggers below. 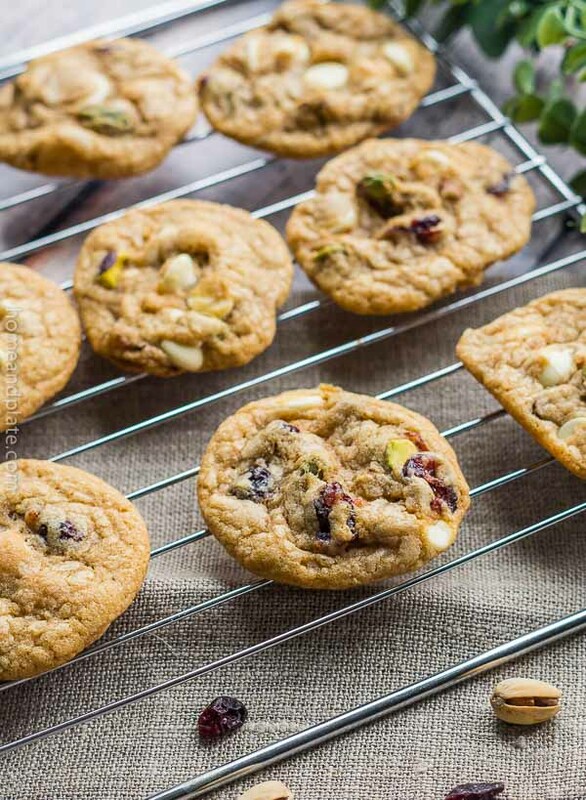 With the holidays approaching I thought a healthy, sweet and tangy treat was in order. Scones are a type of cake or quick bread typically made with cold cut butter, flour and baking powder. Lightly sweetened scones are tender and moist on the inside, crispy on the outside, cut into squares or triangles and served warm. 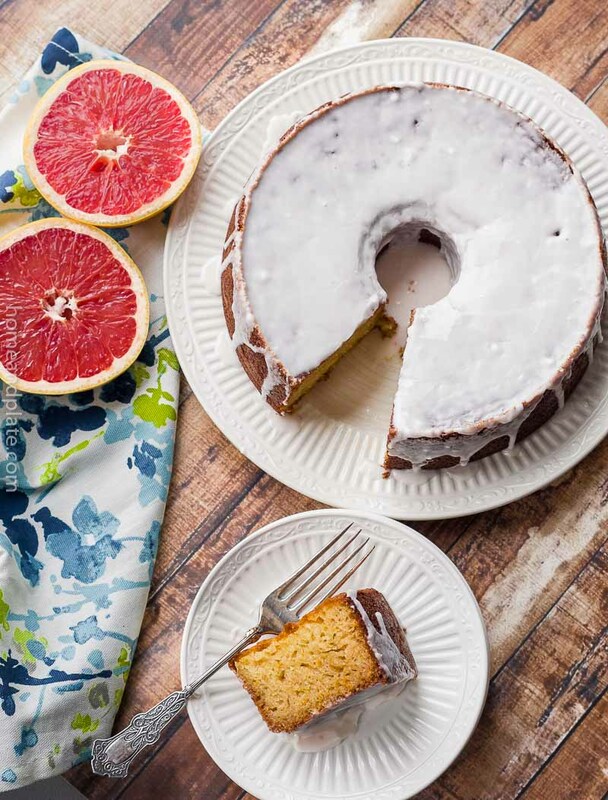 I’ve topped mine with a sweet lemon glaze because we like it sweet in my house. These scones are delicious for dessert and even breakfast. So skip the coffeehouse and whip up your own homemade recipe. 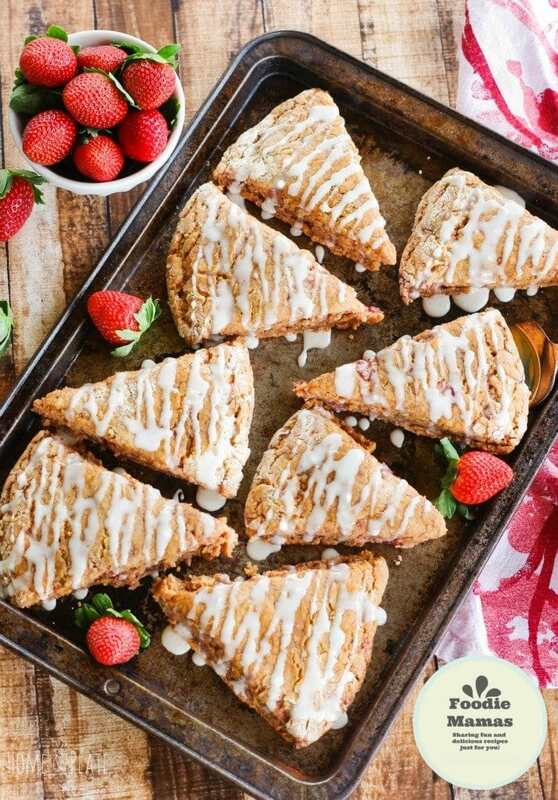 Wouldn’t these whole-wheat strawberry ricotta scones with a lemon glaze make the perfect homemade gift for the foodie in your life? 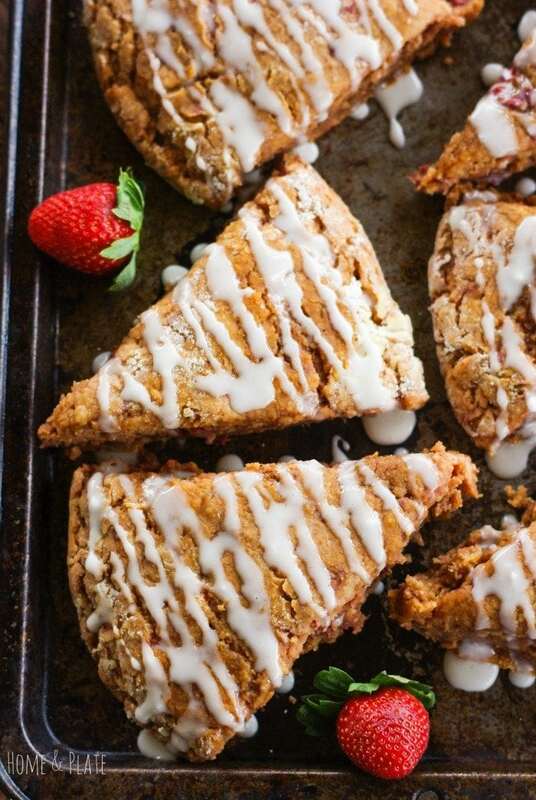 Strawberry Ricotta Scones with a Lemon Glaze are made with whole wheat and drizzled with a sweet lemon glaze that will have you asking for seconds. Preheat the oven to 425°F. In a large bowl mix together the flours, sugar, baking powder, salt and lemon zest. Add the cold butter to the flour mixture after using a pastry butter cutter, a box grater or a knife to chop the cold butter into pea sized portions. I use a box grater and "shred" the cold butter like I would any vegetable. Mix it into the dry ingredients. Next, gently fold in the chopped strawberries. Add the egg, whipping cream and ricotta and mix until just blended. Sprinkle a tablespoon of flour onto a wooden board and add the batter on top. Sprinkle a spoonful of flour on top of the dough using your hands and form it into an inch-thick circle or rectangle. Use a knife to cut your shape into triangles or squares and using a spatula transfer to a parchment-lined baking sheet. Sprinkle coconut sugar on top of each scone and bake for 15 minutes or until the edges are slightly browned. While the scones are baking prepare the glaze by mixing together one tablespoon of confectioner sugar and the juice from one lemon. Mix well. Allow the scones to cool before drizzling with the glaze. Scones are one of my favorite things to bake. These sound like a little slice of heaven. Give me a fresh scone, a cup of tea and a book and I’m good to go. Christmas vacation goals! Strawberry scones are my favorite – I love your addition of lemon too! Thanks Kathy. The lemon adds a nice tart tang to these scones. Thank you Chrisy:) I think they would be good with any kind of berry. Strawberries are a bit pricy this time of year but the blackberries and raspberries are priced just right. They are so easy to make Marlynn. The lemon glaze sweetens them up perfectly. They would be perfect for a brunch! These look soooo good! Strawberries are quite expensive where I live but I might have to make an exception and purchase a punnet for these light and fluffy scones. They are expensive Payton here where I live too. A great alternative would be blackberries or raspberries. You also could use flash frozen strawberries too in a pinch. Thanks. 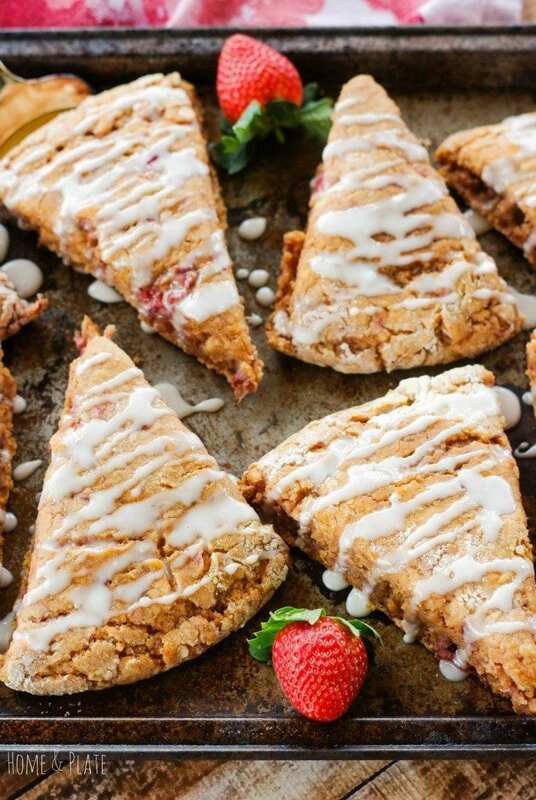 These strawberry scones have me so excited for strawberry season! Is it here yet? ?